What better way to start off a Monday than with another giveaway!?! Today I introduce to you Nicole, Etsy shop owner of SoSewOrganized. In Nicole's shop you will find many different items to keep your life organized, and I know we could all use some help with that! Nicole is also a fellow blogger over at Nicole's Life After 20. Nicole began sewing at the early age of 14 years old, when her grandmother taught her how to sew. Nicole has been able to learn some new things since then. She has "dabbled" in crochet, crosstitch and other crafts, but s always coming back to sewing. When she first began, Nicole started with simple things such as blocks, soon after learning how to sew clothing. When she began making quilted accessories, this is when she realized that this is her favorite type of sewing project. Like many of us, Nicole learned about Etsy through word of mouth and from following other bloggers, who also have shops in the Etsy community. Just like many fellow Etsy shop owners Nicole says, "I was pretty naive about the whole process when I started out.. I've had a lot to learn!" Nicole began her shop in early January of 2012, she started out with just organizational printables, although she did plan on adding quilted accessories later on, all of which she did within just a month or so of opening shop. Now, let's get to hear more about Nicole and her shop through a little interview series and learn about her first hand, in her own words. 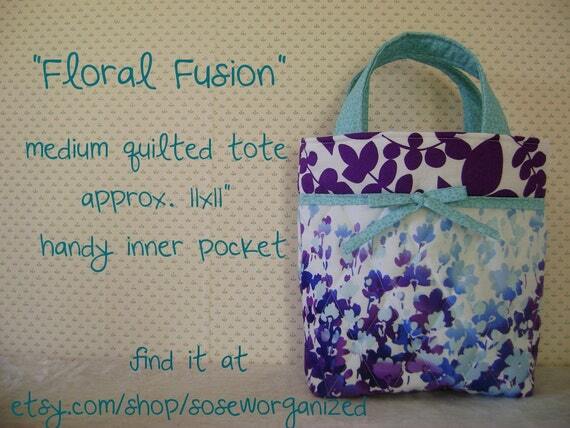 Continue reading on for your chance to win an accessory from So Sew Organized! Q. How did you come up with your Etsy shop name? A. I actually started my shop under my own name, but that seemed boring, and my last name is easy to misspell. I knew I needed a name that was easy to remember, and reflected the variety in my shop. 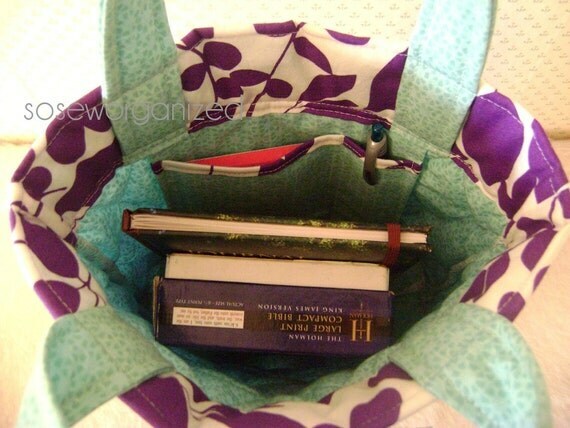 I initially planned on using "Sew Organized," until I found it had already been used in the past. So I added the additional "so" on there, and "So Sew Organized" was born! I feel that this name reflects my products so much better, since it combines the quilted accessories and the organizational items. Q. Where does your inspiration for your items come from? A. I generally get ideas from the items I know I myself would use and love. If I find I need an item that would help me accomplish the task at hand, I'd much rather make it myself than pay someone else to do it! That is how I started making organizational printables in the first place, and I see that holding true as I add other items to my shop as well. Q. What are your favorite materials to work with/favorite mediums? A. For now, I mainly use cotton fabrics... and I love them! There is something so crisp and fresh about a new bolt of fabric! I also am a little obsessed with the zippers I use for my tablet sleeves.. I just love all the pretty colors! Q. Is there any item in your shop with a story behind it? A. 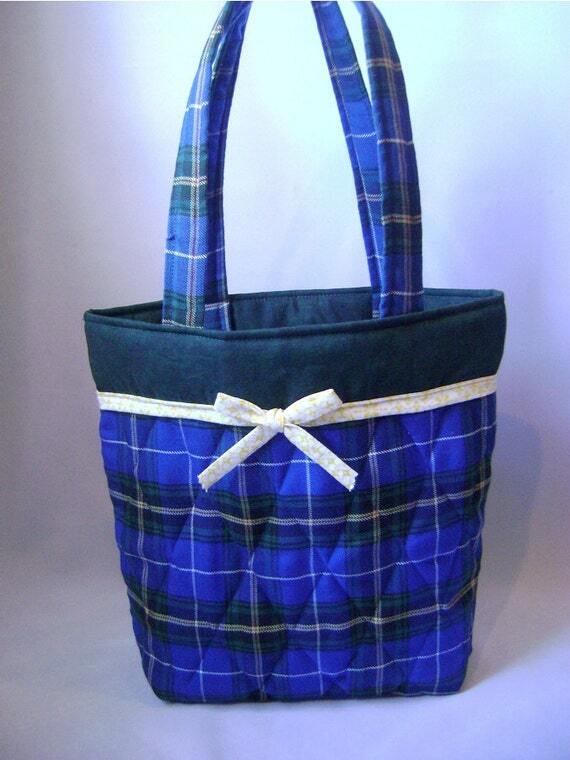 This quilted tote is made with Nova Scotia Tartan. I had never heard of it until I moved to Nova Scotia 3 years ago, but it is the official plaid of this province. Q. Any advice for any shops just starting? A. Be aware that it takes a lot of work to set up shop... but it is worth it! My biggest tip is always be working on having more products in your shop... the more listings, the more chance you have of being seen. Q. Anything else you would like to share with the readers? A. My favorite thing is to create and then place my creations in the hands of people that love them! I hope that you'll stop by my shop and chat with me about what item I can custom make just for YOU! That would make my day! Time to get to know Nicole, the woman behind the creations of So Sew Organized! Q. What is the furthest place you have traveled? A. Argentina and Chile in South America. I got to drive over the Andes Mountains... such an amazing experience! Q. Do you have pets? A. We have a dog and a white cat named "Killer." I'm not kidding. She has a reputation. Q. If you could get back a lost item from your past, what would it be? Why? A. My aunt gave me a beautiful amethyst ring once... and I'll never know where it went. I'd love to have that back! Q. What do you enjoy doing on your spare time? Sewing is actually my biggest hobby, but I also play the piano and enjoy blogging and reading. Q. What would people be most surprised to know about you? A. I still sleep with my childhood teddy bear. RULES AND RESTRICTIONS: GIVEAWAY IS OPEN INTERNATIONALLY PLEASE MAKE SURE TO FILL OUT ALL THE MANDATORY (IN BOLD) OPTIONS IN THE RAFFLECOPTER WIDGET, MAKE SURE TO PROVIDE ALL THE NECESSARY INFORMATION. (ALL INFORMATION AND ENTRIES WILL BE VERIFIED) ON THE END OF THE GIVEAWAY (AUGUST 8TH,2013) A WINNER WILL BE CHOSEN AND CONTACTED. THE WINNER WILL HAVE 48 HOURS TO CLAIM HIS/HER PRIZE, FAILURE TO DO SO WILL RESULT IN A FORFEIT AND ANOTHER WINNER WILL BE CHOSEN. such a great beachy bag!! Click here for wonderful accessories! KOCO and VIKING $50.00 Custom Jewelry Giveaway! !